Mothering her ex-love's children was definitely not in her job description! Ellie Maitland was goal-oriented. She operated on five-year plans. Finishing her master's degree by night, serving as chief administrator at her family's renowned clinic by day, she was out to prove herself, big time. 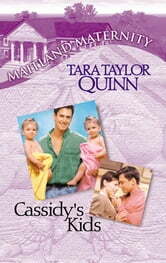 Sloan Cassidy had eighteen-month-old twin daughters, and not a clue in the world how to handle them since his wife had left. But he knew who did. No way was Ellie going to let herself be roped into helping to care for Sloan's little girls. Those kids brought out all the maternal instincts she wanted to suppress. And she had no time. And Sloan was way too appealing. And everyone knew the cowboy had broken her heart ten years ago. Except Sloan.